We take our clipboards with us whenever we are out and about and take any opportunities that we can to register new voters. And we always have plenty of buttons on-hand for any supporters that we meet. It&rsquo;s a fun and effective way to register voters. -- Steve and Sandy in Wisconsin. 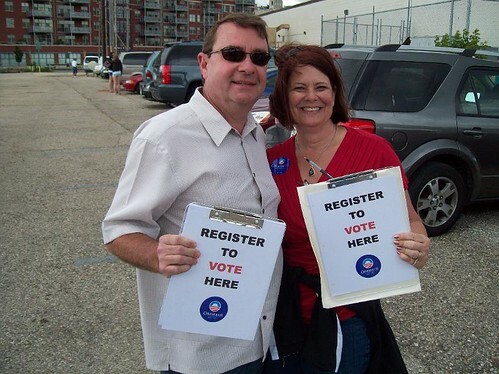 Registering voters is a fun and easy way to be part of our campaign. Carry some voter registration forms with you and you'll be surprised how many new voters you can register at the grocery store, at work, even at your kid's soccer game. Sign up to volunteer and register voters in your community, or find a voter registration event near you.